I ran into the grocery store a few days ago, to pick up one or two items for a recipe I was making. You know how that goes, right? I didn’t get very far before something wonderful caught my eye. Something that made me instantly decide to make this Fresh Corn and Avocado Quinoa Salad as part of our dinner that evening. Actually, it was right there in front of me as I walked through the automatic doors; a display piled high with beautiful ears of fresh corn, for a great price! Not local corn ………. here in North Carolina, the corn has probably just recently been planted. It’s still in the form of tiny, hard kernels, sleeping in the cool earth, waiting patiently for the spring rains and warm sun to do their amazing magic. This corn was grown a few states south of us where warm, sunny days were abundant way back in January and harvesting is already in progress. The display included a big empty bin sitting along side, making it simple to husk the corn right there and take it home, all set to transform into salsas, sandwiches, soups and salads. I was thrilled as I unwrapped the first ear, unveiling tiny, tender, plump kernels in shades of off white and pale yellow. I didn’t waste any time filling up a big bag bursting with the lovely golden ears. My mind was starting to race as I finished my shopping, planning what I’d do with my “corn loot”. I wanted a healthy salad with lots of protein that would work as a complete dinner meal, but could also be used for quick lunches on the go. Quinoa seemed like the perfect choice for the base, as it’s a protein and fiber rich grain with mild flavor. To me it’s a bit like a blank palette that can take on a myriad of different flavor and ingredient combinations. I remembered a fabulous Corn Sauté that I love to make each summer and decided to use some of the same ingredients (and a few new ones) in this quinoa salad. 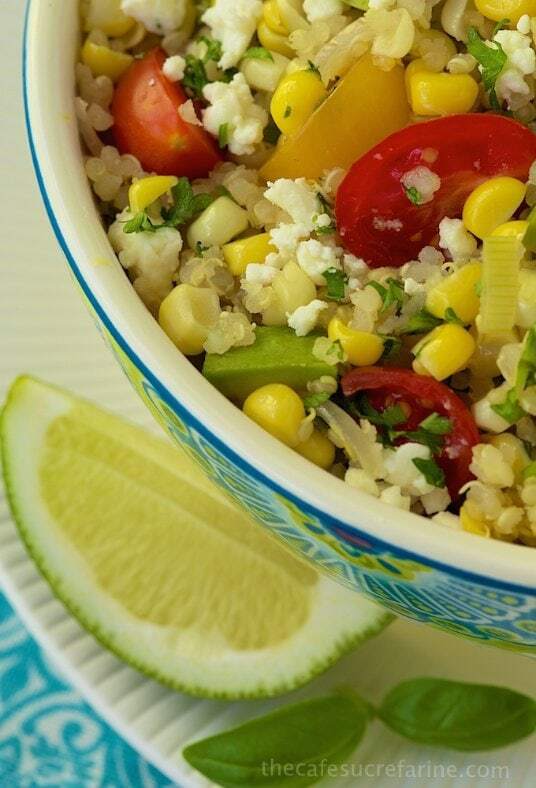 I included shallots, ginger, garlic, green onions, a splash of lime juice, fresh cilantro and basil, avocado, cherry tomatoes and Feta cheese in a addition to the fresh corn kernels I sliced off the cobs. After throwing it together (once the quinoa is cooked and cooled, it takes only a few minutes), I took a bowl of my newly created Fresh Corn and Avocado Quinoa Salad to my husband (and very honest taste-tester). He’s not always an ardent fan of quinoa so I was quite pleased when his eyes lit up with the first taste. “Wow, this is really good!” was his response as he gobbled it up. I felt the same way. The flavors are so fresh and vibrant. I couldn’t wait to eat it again for lunch ………. two days in a row! There’s a small container left in the fridge. After writing this post and looking at the pictures, I’m really craving this wonderful salad again. If you’ll excuse me, I’m going to go indulge … Try it! I think you’ll love it too!! Don’t want to miss a recipe from The Café? to be delivered three times a week to your inbox! Stay in touch on Facebook, Twitter, Pinterest, Google+ and Instagram for all of the latest updates. Bursting with delicious, fresh, healthy flavor, you'll think you just stepped into a gourmet Bistro! Prepare quinoa according to directions found here. Set aside while preparing the rest of the salad. In a large sauté pan, heat olive oil over medium heat. Add shallot and cook, stirring constantly for 2 minutes or until softened and fragrant. Be careful not to burn. Add ginger and garlic and cook for another 30 seconds, continuing to stir. Add corn and green onions and cook for 2 minutes, stirring frequently. Sprinkle with lime juice fresh herbs, salt and pepper, stir to evenly distribute. Add prepared quinoa, diced avocado, cherry tomatoes and half of the Feta. Stir gently to distribute all ingredients evenly. Transfer to a serving bowl or individual bowls. Garnish with remaining feta and more fresh herbs, if desired. This makes a lovely main dish salad but it's also a great side for grilled entrees. I’ll be making this again for sure! It is so great. I was not expecting the rich, great flavors. Thank you for this recipe! Thanks Hilary, that is a wonderful combination of flavors. Thanks Beverly. I really appreciate your kind words. I love that dish too. I just made this for dinner. SO GOOD!!! I added grilled shrimp and it’s a perfect summertime meal! So vibrant and pretty! I’m so happy to know that I’m not the only one who gets side tracked at the grocery store. I’ve been cooking more with quinoa lately and this salad looks so good, perfect for the warm summer months ahead! Oh my dear Chris you do know how to catch my eye!! All my favorite ingredients here and a salad that could work as my breakfast, lunch or dinner. Hoping you are having a wonderful Easter filled with family, food and friends!! I laughed at your ‘corn loot’. I feel the same way when I come across a great food bargain. I hate to waste anything so I do what you do and race around trying to use up every bit. This is a great salad! Saving this for July when the corn is ripe here. I have been eating so much quinoa lately. Love this salad, Chris. Happy Easter! This is my one of salad and so spring-like. That said I don’t know what’s going on. I haven’t been getting anyone’s posts in my inbox like I normally do. I’m not sure what the issue is. Hopefully I will figure it out soon. Wishing you and your family a Happy Easter! Looks colorful, beautiful, delicious and very healthy! I just adore salads like this, corn and avocado were made for each other. Looks so fresh! What beautiful and yummy look this salad anf lo e the colors Chris! Dear Chris, what a lovely looking salad – so fresh, so colurful, so healthy! It is always wonderful to read that you get inspired by what is fresh and available – I am sure that my kids would love this as they have been asking for fersh corn lately. Alas, it will be a while before it reaches stores around here, so I will have to remember this recipe when I see the first fresh corn hit the stores. I would like to take this opportunity and wish you and your family a very happy Easter! – Frohe Ostern, liebe Chris! I’m going to an Easter barbecue tomorrow, this looks like the PERFECT thing to bring! So gorgeous! and healthy, too! We are surrounded by cornfields! Wishing you a wonderful Easter!